Biola University is a private, evangelical Christian, liberal arts university located in La Mirada, in the U.S. state of California. Founded in 1908 in Southern California, with seven schools and more than 145 academic programs ranging from B.A. 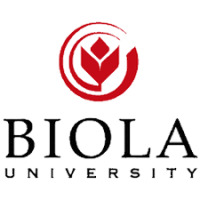 to Ph.D., Biola is recognized as a national leader in Christian higher education -- and the first evangelical Christian college to be ranked by U.S. News & World Report as a "National University." For 100 years, Biola has offered biblically centered education, career preparation and intentional spiritual development in an environment where all faculty, staff and students are professing Christians. NOTE: CosmoLearning is not affiliated or endorsed by Biola University. This page is only intended to credit this content provider for their educational content being included on the CosmoLearning site.